I finally stood in front of the shoes of my dreams—with no windows nor pixels separating us—but this meeting wasn’t what I thought it would be. 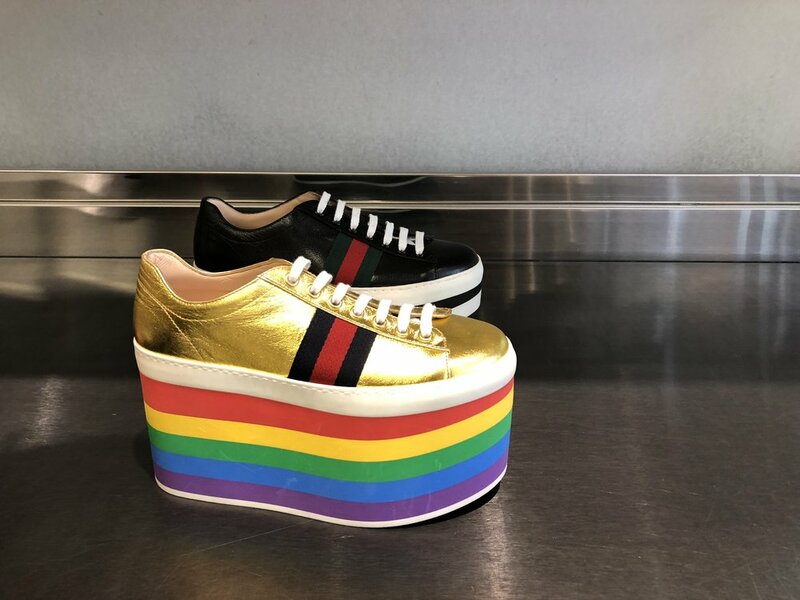 The Gucci rainbow platform lace-up sneakers with gold leather were a sight to behold—until logic, reason and health kicked in. Let me back up a bit. I’ve had a crush on the Gucci brand ever since I can remember. In the ‘80s, my mom used to tote around a black leather Gucci hobo with the crossover Gs and red and green ribbon trim. To match everything, she had a buttery black leather wallet and a black leather keychain. My mother has since tossed the bag—it was in such bad shape as she recalls—but a month ago, she gave me her old, scuffed-up wallet and keychain holder and I’m using the keychain today. I wasn’t such a huge Gucci fan back then—I was more into styling my own colourful clothing while accessories didn’t get me too excited. But now, I see the “added value” of accessories and clothing working their synergies together. And over time, my mom’s style heavily influenced my fashion choices. Fast forward to August 2018: I was at a Gucci outlet recently, and the dream shoes were there—and drastically discounted. I couldn’t believe my eyes when I saw them on a lower shelf. They were as every bit gleaming and bright as I imagined, and I wanted them so badly. However, the practical, mature side of me was whispering in my ear: I could never walk in them. I’m already a tall woman, and if I dared to step into those shoes, all I could see was twisted ankles and scraped knees. If only the soles weren’t that high, I could see a future between us. As unsexy as this sounds, I’d rather be safe than sorry…in a leg cast with six weeks of recovery.